Edinburgh and Glasgow are both amazing cities with great architecture, galleries, history, people to meet and places to go. But what if you have time to spend elsewhere in this beautiful country and you’d like to know where the locals would go? Most of Scotland’s population live in ‘the central belt’ and since 2013 many of them have been flocking to marvel at the world’s largest equine sculpture: The Kelpies. Designed by sculptor, Andy Scott, the two horses’ heads are built over 30ft high in steel. Situated in Helix Park in Falkirk, a five minute drive from Vintage VW Campers HQ. The nearby Falkirk Wheel is the world’s only rotating boat-lift, which links the Forth & Clyde with the Union Canal and is also a must-see when in the area. Loch Lomond and the Trossachs National Park is on our doorstep, just under an hour’s drive brings you to the bustling town of Callandar. Several lochs are in this area providing fishing by permit or other water sports activities. The walking and wildlife watching opportunities here are also fantastic. The Park has become so popular with locals that a byelaw has been passed preventing wild camping in the area; fortunately, there are plenty great campsites to choose from. A three hour drive from Falkirk will bring you to another favourite town, Oban. Oban is a fun port town with opportunities to buy seafood from the pier, take a hike up to McCaigs Tower to see the amazing view. Visit the Oban distillery and take a boat trip to watch seals or take a ferry to Mull, which is a great island to camp on. A boat trip from Mull or Oban brings you to the famous sea cave, Fingal’s Cave on Staffa. Also a three hour drive from Falkirk will take you north to Lochaber and Scotland’s most famous glen, Glencoe. The drive through Rannoch Moor, just before the glen is similarly spectacular. Glaciers and volcanoes formed the breath-taking scenery around here. Glencoe mountain resort is great for thrill-seekers; hiking, climbing, mountain biking and skiing are all popular pastimes here. There is a National Trust for Scotland Visitor Centre to help you discover the history of the Glencoe massacre. A further two hour drive brings you from Glencoe to Arisaig. Arisaig is a small village at the start of sandy coastline which runs up to the Sands of Morar. Not only are the white sand beaches stunning but the views to the Isles of Eigg and Rum are similarly so. A perfect spot to catch an amazing sunset from the many great campsites along the shoreline. If you have time to drive the North Coast 500, then do not miss Sango Sands, a mere 259 miles from Vintage VW Campers HQ is this other-worldly beach at Durness. As you are now at the end of the Scottish mainland, you could say you are at the end of the earth in some respects. The beach is surrounded by cliffs and conveniently at the top of those cliffs is a great campsite. Durness is the village where John Lennon spent his childhood holidays and understandably had to bring Yoko for a visit in later life. Also check out nearby Balnakeil Beach and Craft Village. Be sure to have a hot chocolate at Cocoa Mountain. So now only the sea separates you from the Orkney Islands, the nearest port from Durness is Scrabster, but you can also take ferries here from Aberdeen or Gills Bay. The west Orkney mainland is a magical pre-historic landscape protected by its UNESCO World Heritage Site status. The Ring of Brodgar standing stone circle was built between 2500 and 2000 BC and its unconfirmed purpose adds to the mystery. The nearby Skara Brae was built in 3200 BC and is an amazing Stone Age village. From Ullapool or Skye you can catch a ferry to the adjoining islands of Lewis & Harris, once again history and beaches are two of the main attractions here for many. The Callanish Standing Stones are as unexplained and magical as the Ring of Brodgar is. The west coast Harris beach of Luskentyre regularly appears in lists of top beaches of the world and it is indeed stunning but do not miss Ardroil Beach in Uig Bay on Lewis. Like Sango Sands it has an ends of the earth feeling and given there’s not much between here and America except ocean, you can understand why. Back down the country, this time on the east coast is the charming East Neuk of Fife. Just over an hour’s drive from Falkirk brings you to this stretch of coastline, peppered with quaint fishing villages and beaches. Neuk is the Scots word for corner and this is indeed a very special corner of the world. So most people have now heard of the North Coast 500 but did you know that the West Coast 400 is now a packaged adventure roadtrip you can dip in and out of covering Oban to Campbelltown? We also have a South West 300 roadtrip and this takes in stunning drives like The Devil’s Beeftub and favourite spots like Moffat & Kirkcudbright. I have a deep, life-long love of Skye, having holidayed here in the 70s and every decade since. 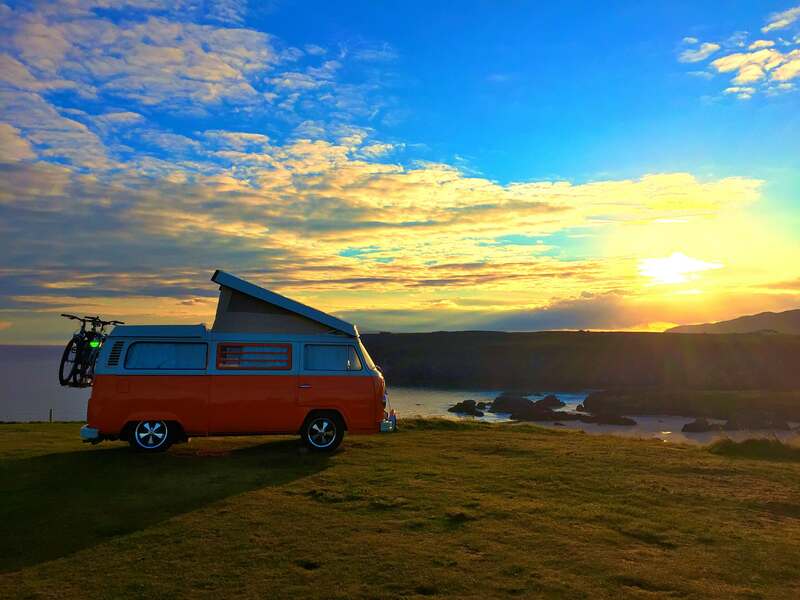 It is the most popular location for Vintage VW Campers guests to go but it can get crowded in summer months and I’d recommend going here in Spring or Autumn if you can. We have other itinerary suggestions and recommended campsites to help you plan your roadtrip. 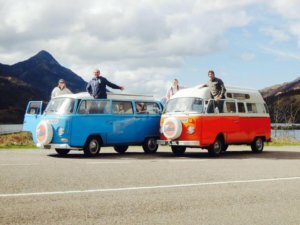 Or choose your favourite campervan on our fleet and get booked with us for an adventure of a lifetime.